DAY 3. Cooktown-Mossman. 255 km, approx 3 hrs 45 mins. DAY 1. Mossman to Cape Tribulation. Take the signposted turnoff in Mossman and drive 6km to Mossman Gorge. The gorge is the traditional home of the Kuku Yalanji Aboriginal people. Take a cultural tour and visit the art gallery at Mossman Gorge to learn more about their unique Rainforest Aboriginal culture. Nearby Cooya Beach is the first stop along The Bama Way - an Aboriginal Journey along story-lines, through coastal mangroves, rich rainforest and hilltop Savannah. Take the Aboriginal-owned tours along the way for a wonderful insight into different facets of Aboriginal culture. From Mossman it is just a short 25km drive along the Mossman Daintree Road to the Daintree River vehicle ferry, which operates continuous transfers across the river (cost applies).Visit Daintree Village, just a few kilometres further up the road from the ferry crossing. This historic village on the Daintree River is popular for wildlife spotting, river cruises, guided rainforest walks, scenic valley drives, galleries and restaurants. Along the way, why not take the scenic route and visit Wonga Beach. At the entrance to the Daintree Valley Wonga Beach stretches from the Rocky Point, at the southern access of the Captain Cook Highway to the Daintree River in the north. Wonga Beach is easily accessible and is often overlooked by tourists. After the ferry crossing, look for the sign to Alexandra Range Lookout. This is a good place to take a short break and enjoy views overlooking the Daintree River mouth, offshore islands and along the coast to Port Douglas and Cairns. The Daintree Coast is a small part of the Kuku Yalanji tribal area and has great spiritual and cultural significance for these people. Their stories, songs and dances continue to give special meaning to the landscape. There are numerous boardwalks, educational centres, river cruises, crocodile spotting and adventure activities. Daintree and Cape Tribulation have many resorts, lodges and backpacker hostels, both tucked away in the rainforest and close to the beach - so soak up the Daintree atmosphere and stay a day or two. Road Conditions: Unsealed suitable for 4WD only. 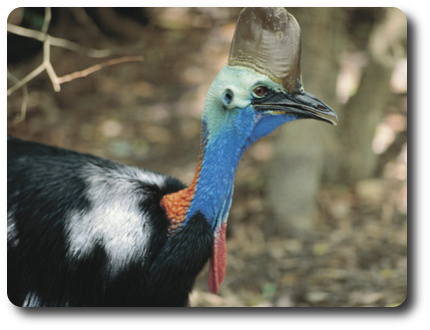 From Cape Tribulation you will be travelling along the coastal road to Cooktown. 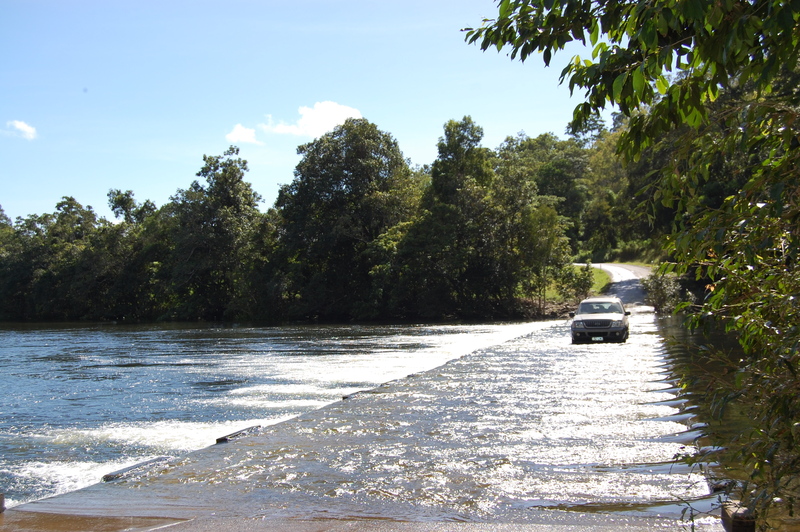 The Bloomfield Track provides 4WD access from Cape Tribulation to just south of the Bloomfield River where it connects with the existing road to the township of Ayton and onto the Mulligan Highway leading to Cooktown. You will pass by Wujal Wujal Aboriginal community, Cedar Bay National Park, Black Mountain National Park and Keating’s Lagoon before arriving in Cooktown for the night. For a touch of authentic Australiana stop off at the Lion’s Den Hotel, an old Australian pub, for lunch, and then continue through to visit the majestic Black Mountain. DAY 3. Cooktown to Mossman. From Cooktown, follow the Mulligan Highway to the tiny township of Lakeland Downs, in the heart of the Laura River Valley. This is now a major coffee and banana growing region. Less than an hour’s drive further south you will find the Palmer River Roadhouse. As you look at the solitary Palmer River Roadhouse perched on the hill above the famous river it is hard to imagine that in the 1870s tens of thousands of miners flocked to this area searching for gold. Today all that is left of the Palmer River Goldfields are a few suggestions, and distant stories of where miners lived and dug. The publican at the roadhouse has a collection of related artefacts. Enjoy sweeping panoramas of Cape York’s huge cattle stations from Bob's Lookout on the Desailly Range. While not obvious, the small township of Mt Molloy has an important connection to Palmer Goldfields and the development of North Queensland. It is here that James Venture Mulligan the founding father of the Palmer Goldfields, rests. His discovery of gold at Palmer River in 1872 sparked the gold rush and massive migration into North Queensland. You can stop and visit Mulligan’s headstone in the small cemetery south of town. Turning left you will follow the Rex Range Road, as it snakes down the range to Mossman. Along the way you will pass through the tiny rainforest township of Julatten. The town has a big reputation among bird watchers. It is here that patient bird lovers have been known to spot up to 200 of the 370 native bird species resident in the Wet Tropics region. The Great Tropical Drive is a self-drive route that will take you from Cairns and Townsville to some amazing places in Tropical Australia. Follow the Great Tropical Drive for 12 days and 2079 kilometres to some of Australia’s best known attractions - the Great Barrier Reef, Daintree Rainforest, Hinchinbrook Island and Undara Lava Tubes - and be prepared for many unexpected discoveries along the way. You can choose from 13 Discovery Trails – each one a unique itinerary that will give you a taste of Tropical Australia: from overnight drives onto the Tablelands, to week-long 4WD and campervan adventures into the goldfields. Cooktown, Port Douglas and Daintree, Cairns and Beaches, Mission Beach and the Cassowary Coast, Tropical Tablelands and Savannah Country, Townsville, Charters Towers and Hinchinbrook.